Drama. 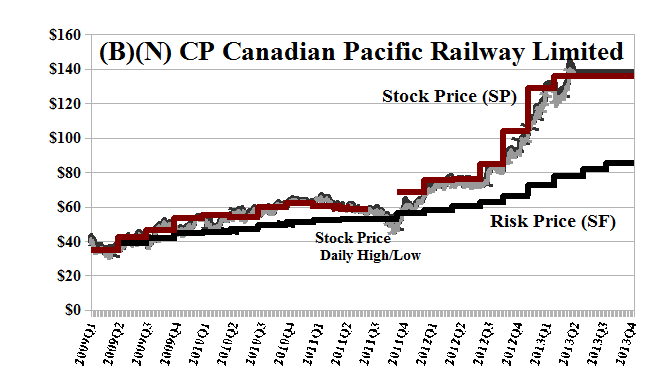 Pershing Square Capital is on the platform and anticipates selling about 7 million of its 24 million shares in the Canadian Pacific Railway during the next several months, always at no more than 10% of the total daily volume which is, typically, 400,000 shares per day (The Canadian Press, June 3, 2013, Pershing Square Capital Management to sell seven million CP Rail shares). They did the math and that means they’ll be selling stock every day for the next 170 trading days (six to twelve months, they rightly figure) in order to “right their portfolio” which is “sagging” on one end and if they sell 7 million shares at the current prices, they’ll get all their money back and still be the largest shareholder, which is not a bad payday for a little agitation in the Boardroom (ibid, The Canadian Press). 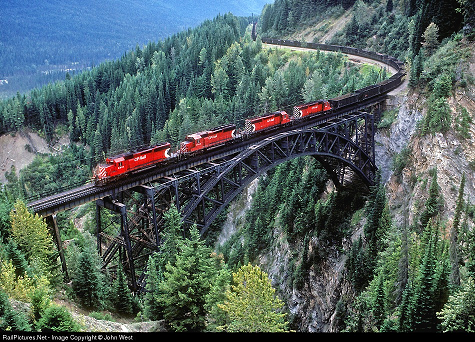 CP coal train on the Stoney Creek Bridge, B.C. There are about 100 institutional owners that hold 123 million shares in all, or 70% of the total shares outstanding, and their portfolios might also need to be “righted”, so we might expect some “track noise” that puts downwards pressure on the stock price if people are unwilling to buy it at these elevated levels of $135 per share which is already twice what it was “worth” a year ago and three times as much as in 2009. Please see Exhibit 1 below. However, not much has really changed since 2009. The dividend is $245 million this year for a current yield of 1% and is up +50% in dollar terms since 2009 and a stock price of about $40 to $50, but other things are the same: the shareholders equity is still about $5.5 billion; the total debt is still about $9.5 billion; and the fixed assets are still fixed (or moving) at about $13 billion; and the gross revenue is up at $5.7 billion from $4.4 billion, but the net income is down from $650 million to a miserly $490 million of which $245 million is going to be paid to the shareholders, and that leaves a lot less in the kitty since 2009 and this might be a rough year for rail if commodities don’t pick up. In other words, it’s not the performance of the company that has improved so much; it is the performance of its shareholders, six of whom control 33% of the stock and another ten who control the balance to 50%, and are now holding it at $135 and looking for new buyers. Our estimate of the downside in the stock price due to the demonstrated volatility is minus (-$18) per share during the next quarter, so we would not be surprised by any price between the current $135 and $117 or $153, but the July puts at $135 are pricey at $6 per share and there are no calls above $145 which sells for $2 today. We could sell the stock today, or hold it between $135 and $145 (ha!) for the next month by taking some of our profits and buying the collar for $4 per share ($6 less $2); that’s still better than just buying the put at $130 for $4 or taking the stop/loss at $117 should there be any more excitement or shareholder distress absent Mr. Ackman and Pershing Square Capital.